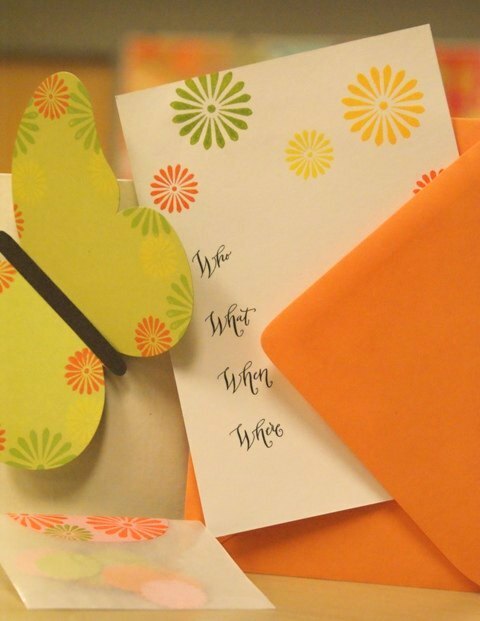 Paper Source Fan Jennifer W. shared her DIY projects from a shower she recently co-hosted. As a regular of our Pasadena store, Jennifer worked with our team to create a bridal shower theme that perfectly celebrated the couple’s wedding plans. Since the wedding colors were black and white with hits of red, I thought a theme of red with hints of black and white would be a nice twist. Jennifer paired our graphic Iron Scroll Wrapping Paper with Red and Eco-White solid papers and envelopes, using this palette for everything from invitations to menu cards to favors. 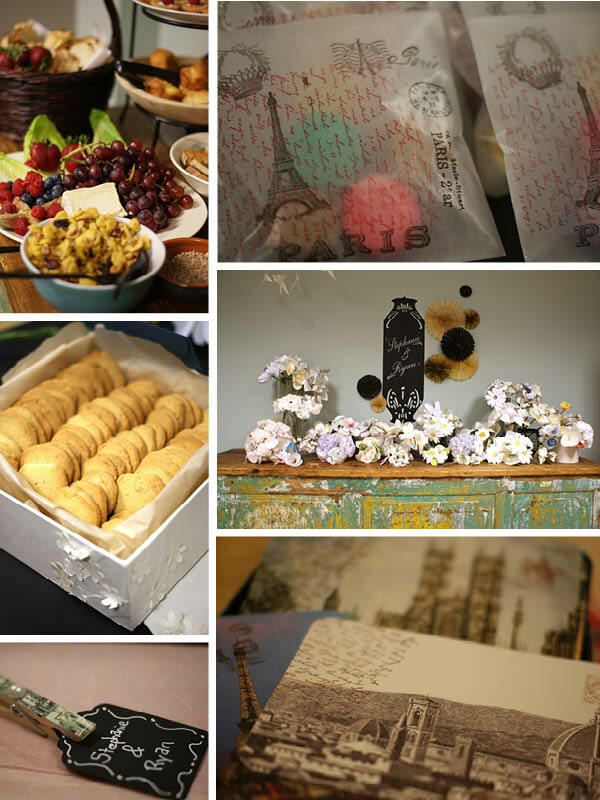 Her DIY bridal shower creations were too pretty to pass up. Our only questions is: Did the cupcakes taste as good as the favor boxes look? It’s a wonderful day when we get to put our products and skills to use at the corporate office, and a colleague’s upcoming nuptials certainly gave us reason to celebrate. The store operations team surprised bride-to-be Stephanie with a day centered around her favorite destination. 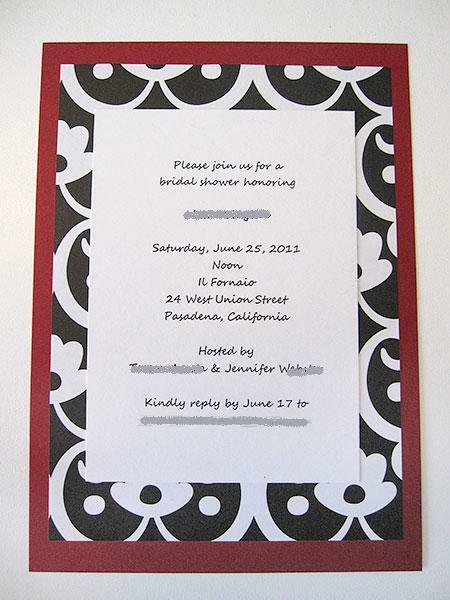 One of our favorite customers at the Highland Park store came in looking for an bridal shower invitation idea. She had a particular color scheme in mind – Poppy and Pool – and wanted our help coming up with a cool idea. As we walked past the printable label sheets, I saw our decorative scissors out of the corner of my eye. “Let’s cut the circle stickers in half with the scallop scissors to make umbrellas,” I said. The hostess loved the idea and we thought you would too. I got engaged and laid off in the same week…in that order. Rather than being entirely saddened by a job loss (well, a little bit), I thought, “Well, now I’ll have time to make all 200 of our wedding invitations, response cards, rehearsal invitations, and open house cards by hand!” Oh, and I didn’t stop there. I also proceeded to make 200 save the dates, 200 reception place cards, and one gigantic paper sunflower, all through the creative inspiration provided by Paper Source! I actually visited the River North location in Chicago so often that my husband (then fiance, of course) called “paper-sourcing” my new job! If you ever feel nostalgic for those sticker collections of early childhood, then let me introduce you to my new crafty best friend, the Xyron Create A Sticker. It brings back memories of carefree days and transforms all sorts of beautiful paper into stickers I can use for grown-up things like cards, files, books, and other craft projects. Recently, I found an even more practical use for my Xyron – making labels! This is not your mother’s old one-font label maker – you can print any font, shape, and color that you want, turn it into a sticker, and label to your heart’s content. I used my newfound labeling skills to spruce up the envelopes for a friend’s bridal shower invitations. 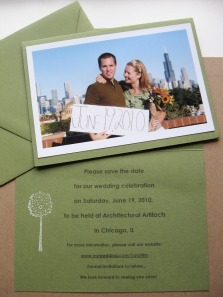 The wrap-around address labels were the finishing touch that the invitations needed to make them look complete and professionally crafted. It was all courtesy of my Xyron, a little imagination, and other crafting essentials (awesome postage stamps never hurt either!). One of the most stylish gals I have ever met is getting married in June, so it was not surprising to receive a gorgeous peacock-inspired wedding invitation, which set the tone for what is sure to be a beautiful night in the Virgin Islands. There was also no surprise in discovering that the blues and greens used in her wedding suite provided ample inspiration for this weekend’s bridal shower in her honor. 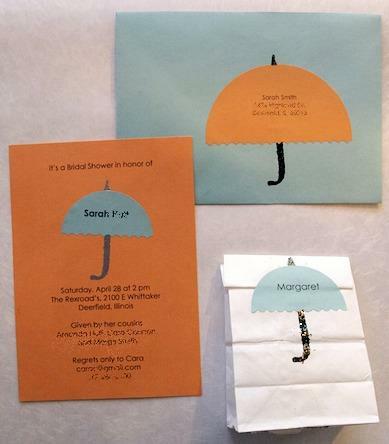 I recently helped my mom make bridal shower invitations for a bride-to-be who will be getting married in Costa Rica. My mom wanted a subtle tropical theme and a unique wedding invite that she could design on her own. 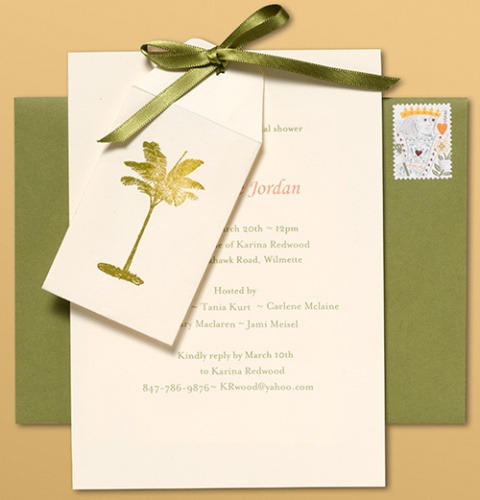 We browsed the wedding inspiration boards at the Evanston store for ideas, and loved a sample we found of a palm tree stamped onto a baby envelope. 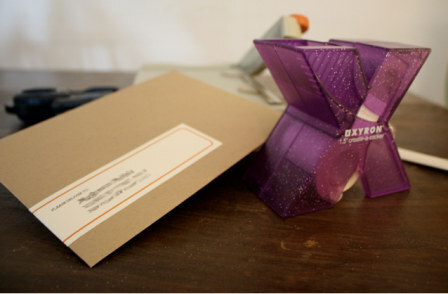 We decided we would print the invitation onto an A7 card, then attach the baby envelope with satin ribbon. When it comes to throwing a party, big or small, we hear from customers that one of the more challenging things is creating a theme. If you’re planning bridal shower or bachelorette party, you want it to be special for your guests and the bride-to-be. Lucky for you, we’ve pulled together some of our favorite themes and ideas into one great class, the Perfect Shower Invites Workshop. I like to think we’ve covered just about everything – from pretty luncheon invites, to an edgy martini girl’s night out bachelorette party, and a few other lovely party ideas tucked in between. Make this zero calorie dessert as a delicious party favor for your next dinner party, ladies lunch or tea. With scallop icing trim and chocolate curls, they are lovely to decorate a place setting or stack them on a cake platter for a centerpiece. 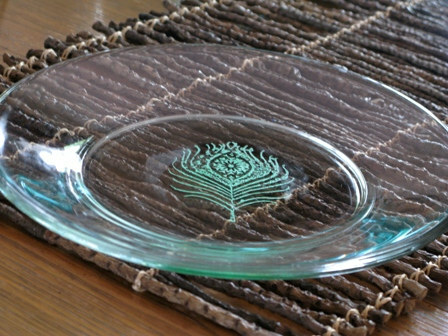 Also wonderful as bridal shower favors or decorations. Use our PDF template to cut out each cake shape for easy assembly, and choose any colored paper to create your own combination of “flavors”…red velvet…strawberry…dark chocolate!